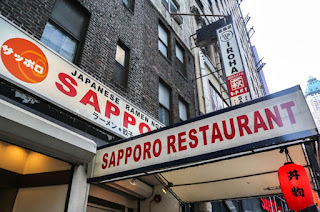 Ed writes in: "I’m sad to report that while having dinner this evening at Sapporo between 6th and 7th, I found out they’re closing at the end of the month. I’ve been going there for years and the staff is exceptionally close and dedicated. They were told a few days ago they’ll all be out of work in a few weeks. I spoke with the cashier and she didn’t have a clear idea of what was going on. She knows that all the restaurants in the adjacent buildings are being closed down. Maybe the owner is selling the buildings? Sapporo is always packed and a great affordable place to eat. I’m so sad." A phone call to the restaurant confirms that today is their last day--they will close for good at 5:00 p.m.
Sapporo Restaurant opened on West 49th Street in 1975. On their website they say they were "the first to bring Japanese ramen to New York City." Robert Sietsema wrote about it for Eater, calling it "a kind of diner for Japanese ex-pats, specializing in homely luncheon fare that included gyoza, fried chicken, katsudon, curry, udon, and, most particularly, ramen. In fact, it was one of the few places in New York City that offered the Chinese-inspired wheat noodles at a time when they had not yet been fetishized to the extent they are now." Plenty of other inexpensive Ramen places in the city. Such a great place. I will miss the gyoza and chahan as well as the atmosphere. oh no! I love that place. Always a great spot for a pre theater meal. loved their yaki soba. If you ever make it to the East Village, try Rai Rai Ken on East 10th Street. I think they even have a branch uptown, though I can only speak for the one in the EV. Excellent selection of Yaki Soba and many other authentic Japanese dishes. Between 8th avenue & 9th avenue. I had a great affection for this restaurant and if it opened in 75 I feel like I've been going there since 75. Before the renovation. And when the soup bowls seemed larger. The chef behind the bar was one of the great characters of NYC until he retired to the back room. He was an artist in his handling of those steaming noodles. So I went there expecting a meal....gone. Before that Iroha. If Sapporo has moved then good, I will go. I now go to Iroha's sister Saki bar Hagi on 46th.